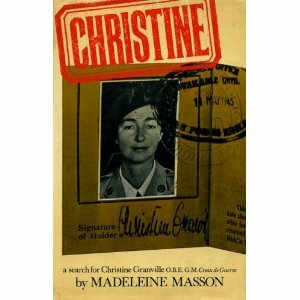 This book has since been reprinted in 2005 and is now called Christine : SOE agent and Churchill's favourite spy. "The remarkable life story of Christine Granville, one of the most successful women agents of the Second World War. Christine Granville, O.B.E. and Croix de Guerre, was one of the most celebrated female agents of World War II. Said to have been Churchill's "favorite spy," her exploits in Poland, Hungary, and France were legendary, even in her lifetime. 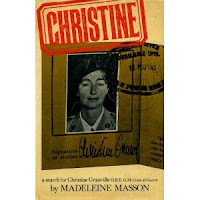 As an agent of the Special Operations Executive, Christine-the first woman to be dropped into France from Algiers-landed in the Vercors in 1944, where as "Pauline Armand," she performed with tremendous valor. Christine is the thrilling tale of a fearless woman ready to die for freedom." After I read Casino Royale, I discovered that Ian Fleming had based the character Vesper Lynd on Christine Granville, which made me want to read about her. That's when I discovered this book at the library. It was originally written in 1976. I wondered how dry the writing might be but this true story is told in a very lively fashion. It is about how an incredible Polish girl, Krystyna Skarbek, came to be a top spy known as Christine Granville who rose to become a top British agent during World War II. Her operations took her to Poland, Hungary and France and at the end of the war was awarded the the French Croix de Guerre medal, as well as the British George Cross, and she was appointed the Order of the British Empire. If you're interested in spies or the second world war, this is an excellent read.